Tyson and I have known each other all of our lives. We really developed our friendship from middle school through sophomore year of high school, and share many happy memories from those days. We lost touch after high school, but reconnected when Tyson was living in Mesa, AZ. He visited us several times, and we visited him in Arizona and then again last year in his present home of Utica, NY. With his career as a psychology professor and mine in software, our schedules have never allowed us to spend more that a long weekend together at any given time. When he saw photos from our trip to Guatemala last year with our friends the Tolers, he saw Guatemala as a place that he could actually visit. He is a newly minted international traveler, having gone to Ireland last year. He asked if he could join us on an upcoming trip, and we were thrilled with the idea. We planned a trip over 4th of July. We spent the intervening months bouncing ideas off one another in order to develop a loose itinerary based on his interests. He is very interested in horticulture and medicinal plants. He wanted to experience the Fuentes Georginas hot springs in Zunil that he had seen in our Facebook posts. He wanted to climb San Pedro volcano. He also was very excited at the prospect of visiting Mayan ruins. Craig and I had not yet visited the Mayan ruins of Iximche, a relatively short drive from Panajachel. We had tried to when we visited with our friend Mukul in 2010, but road conditions and traffic meant that we arrived just as it was closing for the day. This could be a nice day trip. A week before the trip, my paternal grandmother suffered a stroke two weeks before her 93rd birthday. She was in intensive care and was given a dire prognosis. I talked to my family to find out what they suggested in terms of the trip. They said that we should continue as planned. "Mem", as we call my French grandmother, had always liked to hear about our travels. She had a soft spot in her heart for Latin America, as she had a friend who was a Catholic priest in Peru. She liked the fact that we have godchildren in several Latin American countries. She would want us to visit them. We agreed with this assessment. We visited Mem in the ICU on the Saturday before the trip. It was unusual to see her in such a helpless dependent state. She has always been so strong and independent. She and my grandfather had 15 children, 25 grandchildren, 23 great grandchildren, and one great great grandchild. My grandfather passed away 20 years ago, and my grandmother has lived independently in her home since then. She has been in relatively good health up until this point, and her mind has been sharp as a tack. She knows all of her progeny and their spouses' birthday and anniversary dates off the top of her head. She is truly an inspirational woman. We had participated in a Mayan protection ceremony with a Mayan priest last year. I asked Tyson if he had any interest in paticipating in such a ceremony, and he said yes. We decided that we would like to ask the Mayan priest to perform a healing ceremony for my grandmother. We spoke to Humberto about it, and he said that he would arrange it. I felt better going on the trip knowing that we got to see my grandmother beforehand and that we would be doing activities in her honor while away. Tyson drove from Utica to our home near Boston on Wednesday, June 27, arriving mid-afternoon. We spent afternoon and evening with last minute preparations and in excited conversation about the adventures to come. Craig was feeling run down and had a hard time concentrating on packing. His legs felt weak and he was hoping that he would feel better in the morning. We woke up way too early (3:45 a.m.) and drank some much-needed coffee. It was too early to have someone drop us at the Logan Express bus, so we splurged on a ride from Country Carriage, who picked us up at 5 a.m. There was no traffic on the way to Logan Airport. We checked in and found that we once again had to pay $25 per checked bag. Really, American Airlines? Not even one free checked bag on an international flight? We then went toward security, realizing too late that our boarding passes did not indicate that we are eligible for TSA Pre-Check (a benefit of the Global Entry program). With his MS, especially this early in the morning, Craig has difficulty taking his shoes off, taking his laptop out, etc. You always feel rushed, and there is nowhere to lean or sit if he is having balance issues. Since we pay for the program, we are going to insist that we get the benefit. We found a place for Craig to sit down and I went back to the ticket counter. I found someone to reprint my boarding passes after checking our trusted traveler ID. Why can't anything work right the first time? Lesson learned: check for Pre-Check on your boarding pass as soon as you receive it. I collected Craig and we went through the Pre-Check line. Tyson had already made it through the normal line and met us on the other side. We bought some breakfast (I got a strawberry banana smoothie, and I got Craig a yogurt partfait with granola). Craig was not feeling very well, and wasn't able to finish his breakfast. We assumed that it was just the after-effects of waking up so early. With his MS, Craig wakes up very slowly even when he gets a full night of sleep. He hadn't been able to get enough sleep last night, and that sometimes manifests itself as a stomachache...as if you are jet lagged before you even leave home! We boarded our flight, the three of us sitting together and trying desperately to steal a little more sleep. Craig still wasn't feeling well. He was overheated (not unusual for him, especially on planes), and his joints were very sore, especially his elbows. Again, I wasn't too worried and I tried to calm him a bit, saying that he often feels like this when traveling so early in the morning, and urging him to relax. But he seemed preoccupied by it, wondering why he was feeling so strange. He even wondered if he might be getting a fever. We landed in Miami and had a tight layover. Because Craig's legs were feeling especially weak, there was no way that he could walk to the connecting gate. We had requested a wheelchair, which promptly picked him up as we stepped off the jet bridge. The wheelchair attendant took us to a waiting golf cart, and we got on. Tyson decided to go on foot, as space on the cart was at a premium. I told the attendant that we only have an hour before our gate CLOSES, so that he could prioritize drop-offs. He waved me off, pointing to his tablet and saying that he has all of the information. After a couple of trips back to the jet bridge, two other women in wheelchairs were pushed up to the cart, and they boarded. We were full up, and off we went...in the wrong direction. We were dropping one of the other ladies off first. OK...it wasn't far. Maybe she was the only one in this direction and we would then go to our gate. I looked at my watch, and realized that our plane was currently boarding. We dropped off the woman, and she was moving slowly due to her disability. The attendant helped her to disembark and then waited for her to choose a seat. Then he brought her luggage to her. Then he waited while she fished a tip out of her pocketbook. I looked at the board at her gate and saw that her flight wouldn't even start boarding for over an hour. Our driver had a tablet which showed all of our connections. Why would he go in this order when our gate was at the other end of the terminal and was already boarding? Well, surely he would be taking us there now. He pulled a U-turn...a good sign. We approached the gate where we came from...and then promptly stopped. What?! The driver went back to the jet bridge and returned with another person in a wheelchair. And we waited while he helped her aboard, assuring her all the while that there was absolutely no hurry at all. I was sitting right behind the driver, and when he got back into the cart, I reminded him that we now only had 30 minutes until our gate would close. He "yeah yeah"-ed me, and started up the golf cart. This particular cart had no horn. Even when carts do have a horn, people usually ignore it. But with no horn at all, nobody ever knew that we were behind them. Our driver was perfectly happy to come to a dead stop when he was behind someone in the middle of the walkway checking their phone, etc. Absolutely no sense of urgency. Everyone was walking faster than we were driving. After an incredibly slow ride, we pulled over to let off the three other ladies riding with us. One at a time, he helped them off, led them over to a seat, got their luggage...and their flight was so long from now that the gate didn't even show the destination or departure time! This stop was taking so long, I decided to make a break for it. I told Craig I would run ahead...at this rate we were not likely to make it. In the meanwhile, Tyson was waiting at our connecting gate, wondering if somehow we had slipped past him. Everyone else had boarded. He told the staff that he was waiting for us, and that we were being brought by the wheelchair service. They told him that they didn't think we would make it, and that they may release our seats. Tyson refused to board the plane without us; he doesn't speak Spanish and wouldn't know what to do arriving in Guatemala City alone! This gave him a bit more motivation, and as he drove Craig the rest of the way to the gate, he seemed a bit worried and kept looking for me among the foot traffic. Craig had to keep telling him that no, this or that gringa was not, in fact, me. I arrived, out of breath, sweating, and with blisters on my feet from running in my brand new leather sandals, at a gate empty save for Tyson and two flight attendants. I pleaded with them that Craig was on his way, and the wheelchair service was taking forever. One of the women smiled and said "Is that him?" pointing behind me. "Probably not," I muttered hopelessly, knowing how slowly they had been progressing. But it in fact was him. I gathered the passports and boarding passes, and Craig hustled as best he could from the golf cart. The driver escorted him to the jet bridge. As we prepared to board the plane, an employee entered the jet bridge from the tarmac, announced our last name, and asked if it was us. "Yes," I said breathlessly. Yet through it all, our wheelchair attendant kept trying to take Craig by the arm, insisting that he should take his time and that there was absolutely no hurry. Are you serious?! We boarded a completely full flight, and I think I found the last bit of room in an overhead bin further toward the rear of the plane to stow my carry-on. Craig crumpled into his seat, stowing his backpack at his feet. I was still sweating and out of breath as we took our seats just prior to takeoff. Craig's condition was deteriorating. He alternated between overheating with profuse sweating and cold clammy whole body shivers. His joints were very painful and his legs were weak. He was just trying to make it through the flight. Fundamentally, I am against purchasing meals on planes. I feel that it is all part of nickel and diming you to death...especially on an international flight. You pay so much for a ticket, is it really so hard to offer a complimentary meal and one free checked bag? I usually refuse to purchase food on principle. I'll choose overpriced airport food over overpriced airplane food any day. But I was now quite hungry, as I hadn't had a chance to buy anything in Miami. Tyson was buying a couple of snack boxes, so I couldn't resist. I bought a cheese, grape, and cracker plate which was actually surprisingly good. I knew that Craig wasn't feeling very well when he didn't even want to eat any cheese. As the flight landed, Craig was feeling quite nauseous and his mouth was watering. He was in rough shape. Luckily, we had reserved a wheelchair for Craig. We went through immigration, picked up our checked bags, and went through customs. We had even landed early. That never happens here. But we would need to wait a couple of hours to be picked up. In a happy coincidence, Paola would be finishing her surgery nursing practicum early this afternoon! We encouraged Humberto to pick her up first in Cuilapa, and then swing by the airport to get us. On any other day, this would have been perfectly fine. But today Craig couldn't wait to get to the house and go to bed. There is no place to sit inside the airport, and hanging out on the curb with people desperately trying to sell you taxi service or souvenirs among the traffic exhaust would not work for an extended period of time. We needed to find a comfortable place to wait. We asked the wheelchair attendant for advice, and he told us that there are two cafes, located on either side of the airport exit. We went to Macinare Cafe. We got settled at a back corner table with comfortable chairs. We each got a soda and I texted Humberto. He replied that they were already in Cuilapa, so they were running ahead of schedule. In the coffee shop, Tyson got his first glimpse of people in traditional Mayan attire. He and I chatted, but Craig was just trying to survive. He was not looking forward to the long ride back to Panajachel. The ride can make him a little nauseous at the best of times. So he took some Bonine as a precautionary measure. We got a text saying that Humberto would arrive in 10 minutes. We went to the rest room in anticipation of the long ride, and were just about to exit the cafe and head out to the curb, when four people entered the cafe. At first I didn't recognize them...I had expected Humberto and Paola...and instead here were Eddy, Yoselin, Paola, and her boyfriend Cristian! It had been a year since we had seen them. Eddy in particular had grown taller and filled out more...he was now 9 years old. Yoselin, almost 16, had also grown taller. We greeted all of them and introduced them to Tyson. Paola was a bit confused at first, because she thought that our guest would be Sonam Tshering from Bhutan (we had taken him on a trip to Ecuador earlier in the year). But we explained the situation, and she would soon become enchanted with Tyson's offbeat sense of humor. She still wants to meet Sonam someday, though! Paola instantly switched into nurse mode when she saw that Craig wasn't feeling well. She and Cristian escorted Craig out to the van. Humberto greeted us with a big hug. He made a boxing joke when he met Tyson, which is all the more funny because Tyson owns a boxer dog and Humberto used to be a boxer himself. Tyson said that he thinks Mike Tyson is better name recognition than Tyson chicken. Paola and Cristian got Craig settled into the front seat so that he could stretch out a bit. Yoselin sat in the back. Paola was exhausted from her practicum, and she and Cristian tried to catch a nap on the ride. Tyson and I sat with Eddy. There was a lot to see as we drove out of the city. The zoo next to the airport, the brick aqueducts, a Pollo Campero fried chicken restaurant on every corner...it was sensory overload for Tyson. When you have been to a place as many times as we have been to Guatemala, you get accustomed to things. Sharing it with someone new lets you see familiar sights again as if for the first time. Craig was too out of it to participate, but I ws pointing out everything...There's the McDonald's shaped like an old school Happy Meal box. There is the building with actual cars sticking out of the facade. Why on Earth would there be a Taco Bell in Guatemala? Look at that chicken bus! As we drove down the Panamerican highway towards the highlands, city gave way to nature and agriculture. Humberto used a shortcut through some side streets to avoid the ever-present traffic jam in the gritty town of Chimaltenango. Humberto pulled over and Paola jumped out of the van to purchase a snack: roasted corn. This corn was served on a plate made of cornhusk, with lime and salt. Craig and I weren't hungry, but Tyson and the family enjoyed this traditional snack. We made several other stops in search of wild hongos (mushrooms). Typical Guatemalan commerce: competition sets up right next door to one another. You would think that mushroom sellers should spread out; they would have a better chance of getting business if they didn't have to split customers with someone selling the exact same thing 20 feet away. But they sell near where they pick the mushrooms, and the free market economy takes care of ther competition. The first woman we came across was charging twice the amount that Humberto had paid the day before. She wouldn't budge on the price. This caused Humberto to move 20 feet down the road where some smiling but shy kids were eager to sell to us for the normal price. We continued to wind through the mountainous roads to Solola, the capital of the department where the family lives. We stopped at a couple of places that sold mattresses and Paola and Cristian talked to people there. We weren't quite sure what was going on. Tyson is a Pokemon Go enthusiast, and in the car he taught Eddy how to play. Eddy took to it quite naturally, and this was a great ice breaker between them. Eddy has traditionally been shy to speak English, but he seemed to have no such inhibitions when it came to chatting with Tyson. Poor Craig was just trying to survive, trying to doze off but with little success. He could not wait to get to the house so that he could go to bed, and it seemed to him that we sure were making a lot of stops along the way! Speaking of stops...as we drove from Solola down to Lake Atitlan, we stopped at a scenic overlook to give Tyson his first view of the spectacular scenery. The volcano-rimmed crater lake was familiar to Tyson from some documentaries that he had watched. One documentary has also mentioned the Serpent of Lake Atitlan, the region's own supposed Loch Ness Monster style legend, whose name we would invoke for the duration of the trip. The lake is over 1000 feet deep in places, and Tyson's mother made him promise her that he would not go swimming in the middle of the lake. Tyson was quick to point out the obvcious question of why anyone would want to swim in the deep dead center of a 130 square kilometer lake. Tyson was really impressed by the scale of the lake, which doesn't come across in photos or on TV. 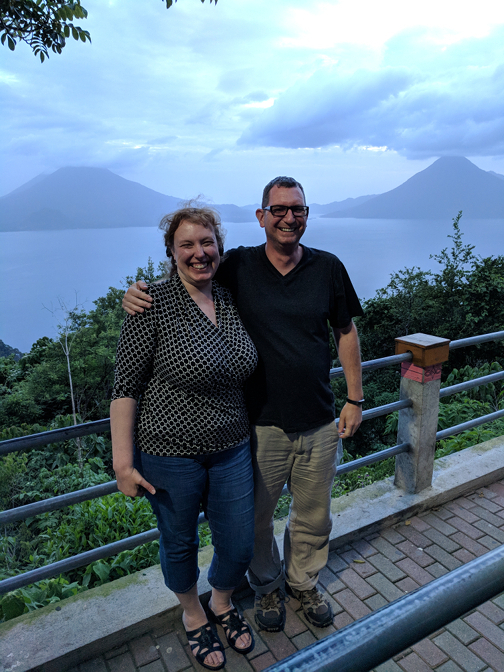 We drove the remainder of the way down to Panajachel. In town, we passed a large new chain supermarket, La Torre. Eddy seemed very impressed by it and called our attention to it. We turned down Calle Santander, the main tourist street. We passed souvenir stalls, restaurants, and pop-up sidewalk eateries. Everything was lit up and it was buzzing with people. Tyson had been growing tired on the ride but he suddenly got his second wind, energized by the frenetic street scene. We arrived at the house at around 6 p.m. We were greeted by the rest of the family: Paulina, Yasmin, Vanesa, Aracely, and little Ian Ivan. The latter, having just turned three years old, was playful yet shy, not quite sure what to make of us, but smiling from behind the safety of mom Paulina. The guest rooms that they had prepared for us were upstairs, but it became apparent as they helped Craig walk down the alleyway to the house that he wouldn't really be able to negotiate stairs in his current condition. So they adapted and set us up in our original room downstairs, with Tyson next door in "Mukul's room." Craig apologized for being so antisocial, but we all agreed that the best thing for him was to go to bed. We hoped that a good night's sleep would have him feeling much better in the morning. I showed Tyson around. There were lots of changes at the house, including a brand new refrigerator and a new credenza/cabinet in the kitchen. (These had apparently just been installed yesterday). When I looked up to see the time, I noticed a new clock! They had had the same plastic orange wall clock since we first visited the house in 2007. It had fallen off the wall numerous times, and had the battle scars to prove it. It had taken a lickin' and kept on tickin'. I remarked upon it with Paulina, who laughed and said that it had finally died. After years of attempting to grow a small patch of grass in a high traffic area, Humberto had given up on his dream of a tiny lawn. In its stead, he had extended the cement patio, and had installed cement planters along the perimeter to protect his flowers from kids kicking a soccer ball around. I took Tyson up to the roof deck. The stairwell is not built for people of our stature, so we had to be careful to duck down so as not to smash our heads on the corrugated metal roof. We came back down and the family gave us tea and prepared for dinner. They asked if Craig wanted anything to eat or drink, but he was already sound asleep. I knew his stomach wasn't feeling right, and he would prefer to sleep than eat. We ate dinner with the family: a delicious homemade vegetable soup. It was served along with the fresh mushrooms that we had purchased along the ride, grilled to perfection. Ian Ivan was sitting next to me during dinner, and he was already warming up. He was curious about me, and we played a game of tapping each other's hand in Morse-code like patterns. It had been a very long day, so after dinner we said our goodnights, eager to be able to explore town together when we were both better rested. And hopefully Craig would be feeling well enough to join as well! On the road to Panajachel! Humberto picked us up and was accompanied by Paola. her boyfriend Cristian, Yoselin, and Eddy. We stopped to buy some grilled corn (served with salt and lime, just like tequila) from a roadside vendor. Stopping to buy some hongos (wild mushrooms) from some kids on the side of the road. We would enjoy them grilled with dinner. Tyson's first glimpse of Lago Atitlan. Steph & Tyson with Lago Atitlan in the background"